Slipped discs as you would imagine from the name, don’t actually exist! This is a popular term for a common injury that has lead to a lot of misperceptions about back pain and sciatica – so let’s clear it up and explain what is really going on. Your spine is made up of bony vertebrae stacked on top of each other with a shock absorbing and flexible disc and vertebral end plate in-between each of them. 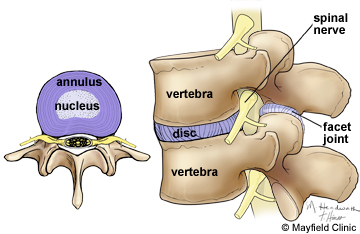 Your spinal cord runs down a tunnel behind the main body and or the vertebrae and the disc as shown. At every level, a spinal nerve branches out of the spinal cord innervating your entire body. Having these nerves in such close proximity to your vertebrae and discs is why back pain now be so painful in the very acute/early stages and this makes the area very sensitive. So now let’s move on to the mechanism of injury, how does a “slipped disc” happen? The technical term for this injury is actually disc herniation or protrusion disc, which describes the injury much more accurately. Many people freak out when they imagine that a disc in their back has somehow slipped out of place, but really they can’t go out of place – this is a really common misperception. Poor posture. If you have poor posture when sitting at a desk at standing then your spine is receiving extra stress. Sustained rounding out of your spine places a lot more pressure through the front of your disc, increasing the pressure on the back of the disc as the gooey substance in the nucleus gets pushed backwards. 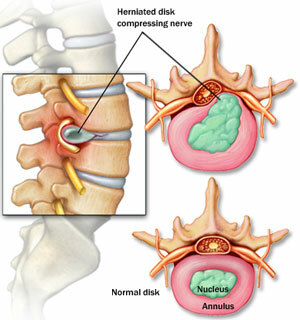 Over time this can lead to herniation to the disc and injury. This is when your spine gets a huge amount of load through it, causing a tear int he outer part of the disc, leadign to a protrusion. This can occur from things like car crashes. Genetics comes into play with a lot of injuries, leaving you at greater risk of injury by way of 1 or 2 above. Genetics is very hard to change though so it is best to try to minimise the risk of the above two causes. What are the signs or symptoms of a disc injury? So how do we help disc protrusions? And most importantly teach you the right technique to lift and how to work with a better posture.